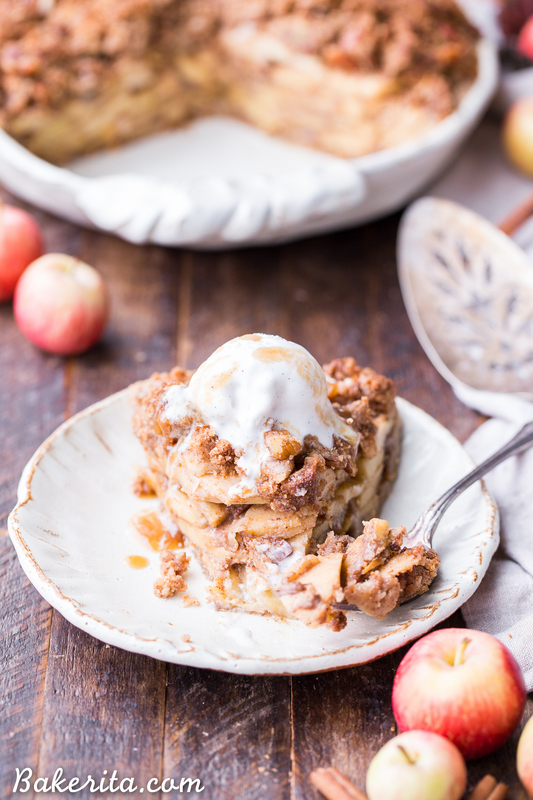 This Apple Crumble Pie is so delicious it’s bound to be a holiday dessert staple! 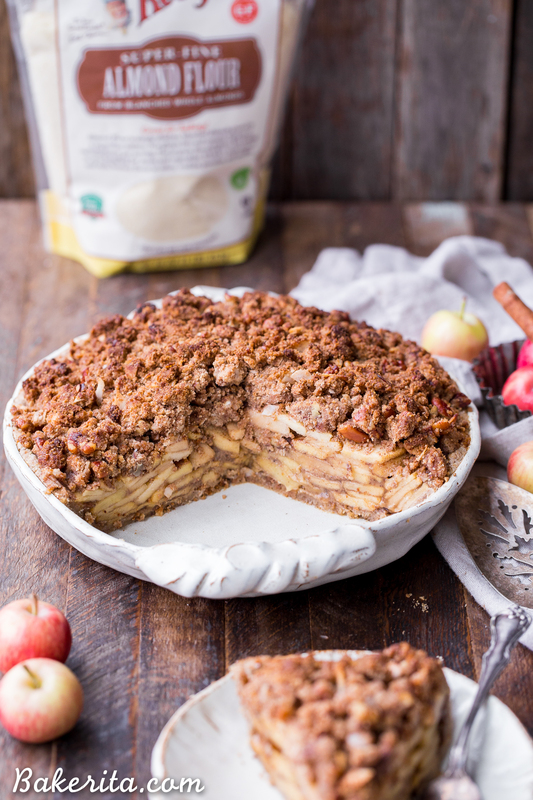 This gluten free, paleo + vegan pie is filled with soft, caramelized apples and topped with a nutty, crunchy paleo crumble topping. This post is sponsored by Bob’s Red Mill. When I meet people in real life that know me from online, usually the first question I hear is, “I didn’t realize you were so tiny!” Not to say I’m a stick or anything – I’m only 5 feet tall, so my height is usually one of the things being referenced. But also, for being a baking blogger, you might assume I’ve got a few more pounds on me than I do. I definitely have a sweet tooth (hence why I started a baking blog to begin with), but over the years, I’ve managed to develop a pretty good sense of self control. I always taste and try the treats I make, but I usually don’t eat too much of them, otherwise I’d be 300 pounds. Certain treats though? My self control goes all out of the window, and I need to either get the treat out of the house or double up on my workouts that week. 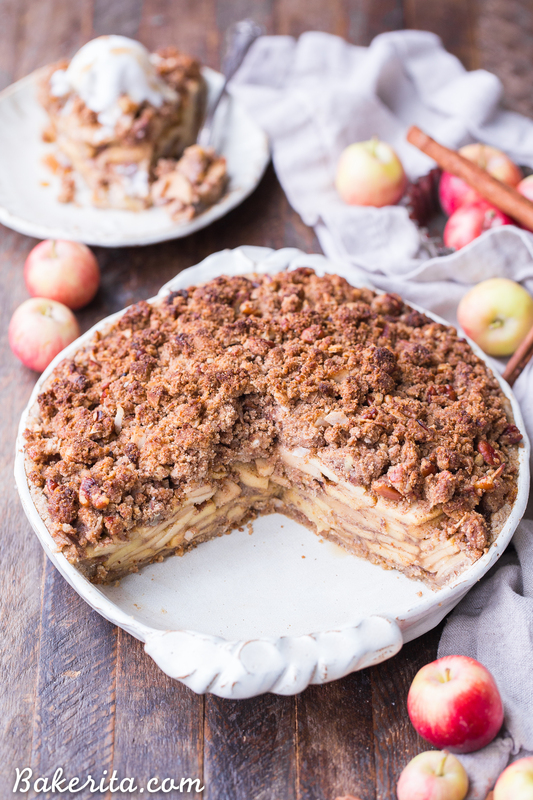 This Apple Crumble Pie is totally one of those treats – I seriously can’t stop eating it. Apple crisps and crumbles have always been my weak spot in the dessert world. I love chocolate and peanut butter so much, but there’s always times where I can turn it down and am not “in the mood” for them. I’m always in the mood for soft, baked apples with piles of crumble topping though. This apple crumble pie delivers on all of the things I love about this kind of pie: flaky crust ✔, soft + spiced apples ✔, and big crunchy crumbles ✔. It manages to do it all while staying paleo and vegan, too! To get that flaky crust and crumble topping, I use flours from one of my favorite kitchen brands, Bob’s Red Mill. For the crust, I use a combo of their blanched almond flour and tapioca flour, and the crumble top uses the almond and coconut flours. They’re all super finely milled and high quality, to help create the best possible final product. The apple filling is thickened with a little bit of tapioca flour, as well. For the filling, you make a quick caramel-like sauce to coat the apples in, and it bakes into the most luxuriously sweet and flavorful filling. The spices and vanilla permeate the pie so every bite is perfection! The crumble topping skips the usual oats to stay paleo, and uses flaked coconut and pecans to add some of the texture that’s missing due to the lack of oats. 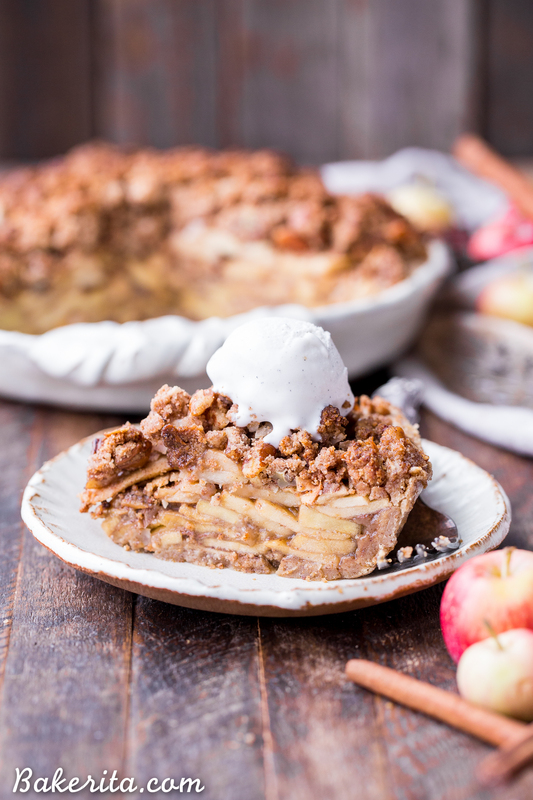 In short, this apple crumble pie is made with wholesome ingredients, but tastes just as decadent and delicious as your classic apple crumb pie. A big slice, warmed up for a little while in the microwave, and topped with ice cream and maybe a drizzle of caramel sauce, is the holiday dessert perfection you’ve been looking for. I hope you’ll add it to your holiday dessert menu – it’s the pie I’d choose :) enjoy! 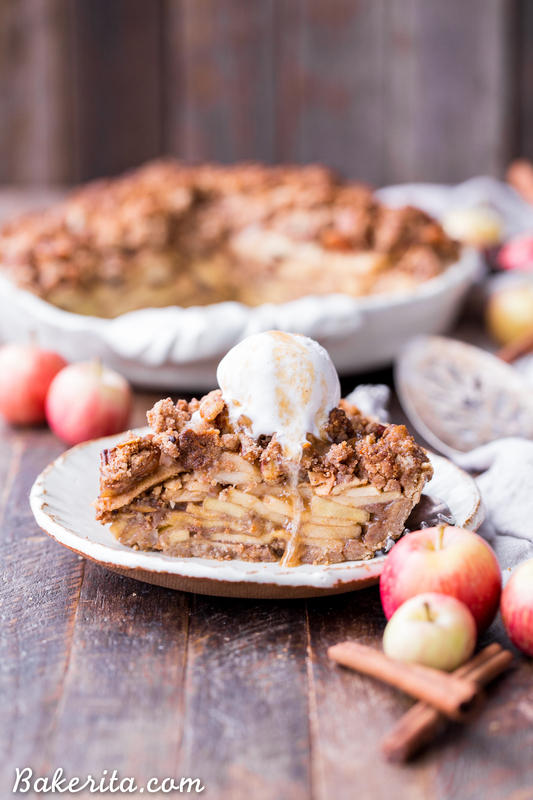 This Apple Crumble Pie is so delicious it's bound to be a holiday dessert staple! 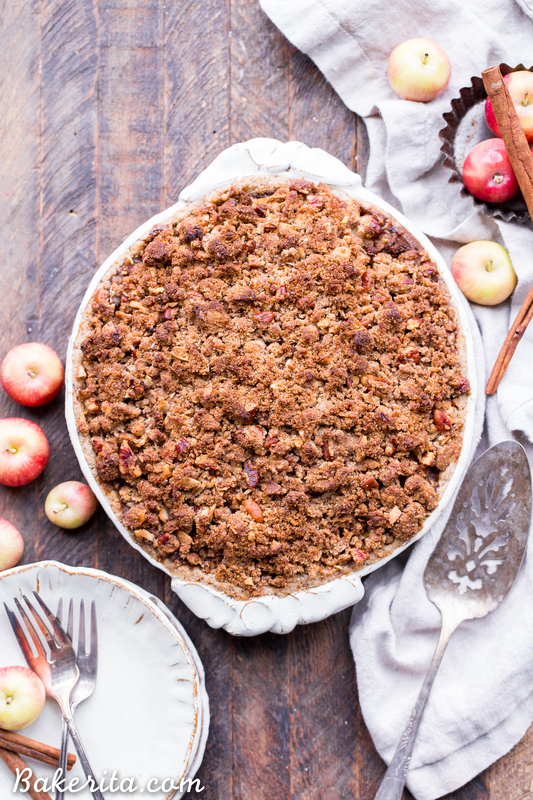 This gluten free, paleo + vegan pie is filled with soft, caramelized apples and topped with a nutty, crunchy paleo crumble topping. Combine the almond flour, tapioca flour, ground flax seeds, coconut sugar, salt, and coconut oil in a food processor, or use a pastry blender in a bowl. Pulse or blend until the texture of coarse meal, being careful not to over-blend the coconut oil. Add the water and pulse or stir until the dough comes together. If you’re mixing in a bowl, you may want to use your hands to bring the dough together at the end. Roll out the dough in between two sheets of parchment or on a silicone baking mat into a 12-inch circle. Carefully lay dough into a 9-inch pie dish (not deep dish). If the dough breaks, that’s okay! Just press it back into place and repair any holes/cracks that may have formed. Place in the freezer while preparing the filling. Place the sliced apples in a large bowl. Melt the coconut oil or ghee in a saucepan over medium-low heat. Whisk in the tapioca flour to form a paste and then whisk in the coconut sugar, maple syrup, cinnamon, ginger, nutmeg, allspice, vanilla extract, and lemon juice. Bring to a boil and let simmer for 3 minutes before removing from heat and pouring the caramel sauce over the sliced apples. Toss to coat all of the apples, and pour into the prepared crust. For the crumble topping, combine the almond flour, coconut flour, flaked coconut, maple syrup, coconut oil, and pecans in a mixing bowl. Stir until the dry ingredients are completely moistened and then crumble evenly over the apples. Place the pie on a baking sheet and bake 15 minutes at 425°F. Reduce the temperature to 350°F, and continue baking for 35 to 45 minutes or until the apples are tender and the pie is golden brown on top. Tent with foil if the pie starts to brown too quickly! Let cool for at least 1 hour, preferably 4 or more, before serving. Serve warm or chilled. Keep any leftovers stored in the refrigerator. This post is sponsored by Bob’s Red Mill. As always, all opinions are my own. Thank you for supporting the brands that support Bakerita! This looks amazing – yet I admit being a tad confused as steps 4 & 5 seem to contradict each other. Am I reading it wrong? If not, can you clarify whether you mean to melt the filling ingredients together & pour over apples or whether they should be tossed into the apples & mixed unheated? I just printed it out give it try. Looks and sounds delicious! I LOVE your pie plate and dishes! Where did you get them? Hi, just a quick question l. Can I use 2 eggs instead of flax seed? Hi Nora, this recipe was specifically developed to be a vegan crust. To use egg, I’d suggest using the crust recipe from this post: http://www.bakerita.com/paleo-chocolate-pecan-pie/. Enjoy! Love this pie so much Rachel! I’m with you on the apples and cinnamon anytime. Can’t get enough… especially this time of year. This recipe is going on my must make list! This pie will make my daughter so happy for Thanksgiving. She has a newly discovered egg, grains and dairy allergy so this pie recipe will allow me to still make her favorite dessert! Thanks so much! I am making this pie right now and it says to add water to the melted coconut oil and tapioca paste but you don’t mention the amount in your ingredient list? So I guessed and added 1 tbsp water and it immediately seized up…..
Im going to remake it and omit any water. Hope its right. Can you clarify a couple of things please? 2. I assume the apples are peeled but it doesn’t say so. Just wondering. I’m actually in the middle of making this now so I’m going to wing the water amount but I can’t wait to bring this to Thanksgiving! Hi Karen, there is no water in the filling – not sure where you’re seeing that in the instructions! The apples can be peeled or unpeeled, it’s up to preference, I prefer them unpeeled. No worries at all! Happy Thanksgiving to you too :) hope it’s a wonderful & delicious one! This pic looks so amazing, but I’ve tried the caramel twice now and it keeps seizing up when I try to add anything to the tapioca and fat. I tried once with ghee and the other time with coconut oil and both times it went totally haywire when I added the other ingredients. My MIL suggested maybe it’s because we are at high altitude. Any thoughts?? Hi Kassie, so sorry I’m just seeing this! I hope you ended up figuring it out…altitude could definitely have something to do with it, but because I’m at sea level, I’m not sure how it would’ve affected it! Thrilled to hear you figured it out and made it work! Glad to hear you enjoyed it, and sorry you had some trouble. Does this pie freeze well? Also, what make ahead and freeze dessert recipes would you suggest? I haven’t tried freezing the whole pie ahead of time so I’m not sure how it would go, but I have frozen the crust and crumble and then made the filling and baked it all when I was ready to serve. For make ahead desserts, all of my no-bake cheesecakes are amazing and meant to be made ahead and stored in the freezer! I don’t have ground flaxseeds. Is there anything that I can replace it with? Hi Sarah, I’ve only tried it with the ground flax as written. You could probably use ground chia seeds for similar results! Is there something you’d recommend substituting the flaked coconut that goes on the crumb topping? I’m not a huge fan of coconut flavors unless you think it’s not too overpowering then I’ll definitely still try it! Hi Ariana, you could use oats in place of the coconut, but that would make it not paleo. The coconut is primarily there for texture. You could also use sliced almonds for a similar texture. Hope this helps! would almond meal work ok here or does it really need to be blanched almond flour? thank you!!! Hi Heather, for the crumble either is fine but for the crust I’d stick to blanched almond flour, as almond meal isn’t as fine and will be harder to work with.